Thanks to all the GMs and players who turned up to Go Play Manchester yesterday (Jan 13) and made it such a fun event. Nice to meet so many new folks, and lovely to see familiar faces too. You all warmed me to the core at the end of a cold first week of 2019. 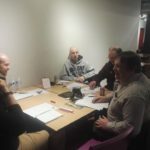 A diverse selection of five games ran, from mainstream games like D&D 5th and Warhammer 4th Ed and Star Wars Edge of Empire, as well as indie RPGs run by their authors, Hunters of Alexandria (Paul Mitchener) and Cthulhu Hack (Paul Baldowski). 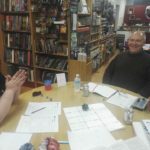 Special thanks to Andy and Bexs who helped me run my first game of D&D 5th Ed proving that an old dog can learn new tricks. Thanks to Hedi at Fanboy 3 for having us, and sorting out the tables beforehand. Next GPM Sunday 10 February, sign up to the newsletter for more info and for notifications when the game sign up goes live (should be 1st week of Feb). If you would like to GM, go to the GMs page read it and use the Games detail form to submit a game. If you can’t see the above spreadsheet, here’s the direct link to it on Google Docs. I’ll be at Fanboy 3 upstairs from 12:30, look for the chap wearing a yellow Monkey T-shirt with long hair, and games start at 1pm and carry on until 5pm. As you can see we’ve a few open spaces which can be filled on the day, if you know of anyone who wants to come along but missed pre-sign up. 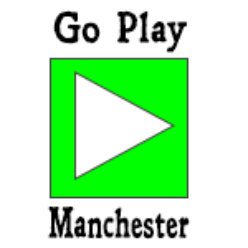 If for any reason you can no longer come, please let me know (newt@goplaymanchester.org). I’m immensely pleased to announce that our first meet up is on 13 January 2019 at Fanboy 3, between 1 pm and 5 pm. To attend, please sign up to our newsletter, which will then tell you when sign-ups are open (which should be Friday 4 Jan). I am doing sign-ups online so we can just get on and play at the event itself. In ancient times the Sorcerer Khalack Maeki established a lair under Terror Peak Mountain. Being of an evil bent, he enslaved the local Goblinoid tribes and waged war against the Elves of surrounding Scarwood. It said that he was amassing a vast army when an alliance of nearby High Elf Warlords attacked his mountain stronghold. Khalack was killed in the final assault by powerful magic unleashed by the High Elves, although the legend macabrely states that his body was never found. The Ring of the Elements, a powerful magical item which was said to be the source of his power, also went missing much to the annoyance of the High Elven Archmages. Khalack’s dungeon lair under the mountain lay deserted for hundreds of years. Keeping its secrets and treasures, since the Elves who now controlled the woods around Terror Peak shunned its lightless corridors. Powerful magical wards left by their warlords sealed the dungeon. 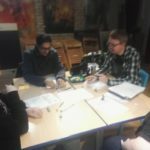 Your group of adventurers have assembled in the town of Goldrush, a town of human opportunists, traders and ner-do-wells which lies on the edge of Scarwood. In a local tavern, you met a charming young Half-Elf called Melanda, who claims to know where there is a secret entrance, long hidden from prying eyes by her kin, to the Sorcerer’s Lair. She owes no allegiance to the guardians of Scarwood and is willing to show you for a cut of the treasure. True to her word she has led you through Scarwood safely and you now stand amongst the trees in the shadow of Terror Peak. An adventure for up to five players with characters of 1st Level, with obvious influences from 80s British Fantasy gamebooks. Returning from your latest mission tired and wounded, the flood waters of the Reik force you into the deep forests as storms rain down upon you. Beastmen, mutants and worse haunt these accursed trees, and as you push on seeking shelter, you fear the worst – until a light appears. A tavern! You are saved! Surely a chance to warm your feet by the fire and rest until the storm breaks… but the locals hide more secrets than you expect in your Night of Blood. Night of Blood is a classic adventure from 1980s White Dwarf magazine re-imagined for the latest edition of WFRP. It’s a grimdark horror fantasy adventure with more in common with the Texas Chainsaw Massacre than The Lord of The Rings. Chaos without and within, betrayal and greed await at the Hooded Man Inn. Tags: Fantasy, horror, Chaos, mature themes. 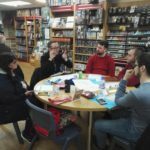 This game is being run by Go Play Leeds Organiser, Guy Milner, who regularly blogs about one-shot games at his blog Burn After Running. You’re maintenance and repair units. You’ve activated to find power failing and no network connectivity except for short range buzz shots to other local units. Stabilize. Restore. Report. This game is being run by its author, Paul Baldowski, who also publishes the game via his Just Crunch Games imprint. 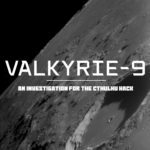 The Cthulhu Hack at Just Crunch Games.